Episode 4, featuring Kiona’s 2008 Late Harvest Riesling. This wine can be found for around $12 for a split size (375 mL) or $15 for a full size (375 mL). We had a special guest on today’s episode, Grandpa John! Happy Thanksgiving everyone! Sorry… no recipe today. We didn’t want to spoil our Thanksgiving feast! Click here to visit the 2008 Late Harvest Riesling page on Kiona’s website. Click here to visit our Facebook page. Become a fan! Episode 3, featuring Kiona’s 2007 Chenin Blanc. This wine can be found for around $10. Click here to visit the 2007 Chenin Blanc wine page on the Kiona website. Here’s a link to the wine aroma wheel. 1. Prepare the salmon: combine the soy sauce, olive oil, lemon juice, lime juice, agave nectar, garlic, ginger, salt and white pepper in a large, shallow dish. Add the salmon fillets and turn to coat. Cover and refrigerate for 1 hour, turning a few times. 2. Make the glaze: Meanwhile, in a medium bowl, whisk the pomegranate molasses with the agave nectar, soy sauce, garlic, fresh ginger and lime zest. 3. Preheat the broiler. Transfer the salmon fillets to a large rimmed baking sheet. Season with salt and brush with half of the glaze. Broil 4 inches from the heat for 3 minutes, until the fillets begin to brown. Brush the fillets with the remaining glaze and broil for about 3 minutes longer, until richly glazed and the fish is just cooked through. Transfer the fillets to plates. 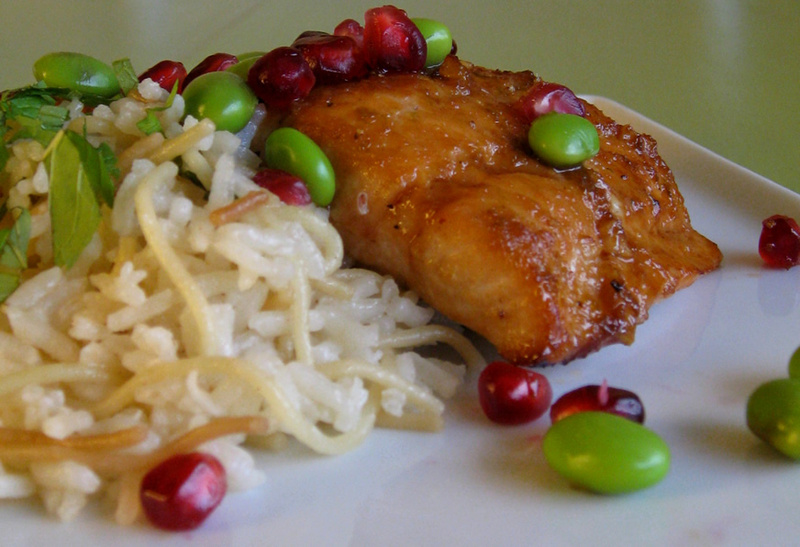 Garnish with edamame and pomegranate seeds and serve with Armenian Rice. 1. In a large pot, melt the butter. Stir in the vermicelli and pine nuts and cook over high heat until golden brown, 3 minutes. 2. Stir in the rice. Add the chicken stock, 1 t. of salt and 1 t. of pepper. Cover and cook over low heat for 25 minutes, until the rice is tender and the stock has been absorbed. 3. Uncover, fluff with a fork and cover again. Let stand for 20 minutes. Stir in half of the mint and season with salt and pepper to taste. Garnish with remaining mint. Episode 2, featuring Kiona’s 2003 Estate Red Mountain Sangiovese, a wine that can be found for around $20-$25. Click here to visit the 2003 Estate Sangiovese page on Kiona’s website. Here’s a link to the 20Something website. Come visit us! We fixed the inverted “mirror” effect from last week’s episode, so that’s pretty awesome. Feel free to leave a comment, and thanks for visiting! Preheat oven to 400 degrees F. Use a fork to poke holes in all potatoes. Bake on a cookie sheet, lined with tin foil, for 45 minutes. Remove potatoes from oven, let cool, remove skins and slice. Add potato slices to a food processor fitted with a standard blade and puree for 3 minutes or until smooth. To make gnocchi, put potato puree in a large bowl and mix in 2 cups flour, a 1/4 cup at a time (you will get a very sticky consistency). Dust hands with a bit of flour and form puree into teaspoon sized oval-shaped balls. You will periodically need to dust your hands with more flour while making balls. (I found this too time consuming in the past, so I roll out a small handful of dough into a log 1 inch by a foot and a half or so and cut 1 inch pieces and repeat with the rest of the dough). Once all balls are made (you will have 90 to 100), take a fork and, pressing lightly, make indentations around the circumference of the balls, being careful not to flatten them. Dust 2 plates or a cookie sheet with flour and place gnocchi on them to air-dry so they will not be quite as fragile. While gnocchi are drying, fill a large stockpot with water and bring to a boil over medium-high heat. Once dry, add gnocchi to stockpot in small batches of about 10 to 15. When they float to the surface, after about 3 minutes, remove gnocchi with a slotted spoon. To make sauce, heat a medium sauce pot over medium-high heat. Let heat for 1 minute, then mist with cooking spray. Add onion, celery, and carrots and saute for 3 to 4 minutes. Add turkey and stir, breaking meat up into pieces with a spoon or spatula as it cooks, about 5 minutes. Once turkey is cooked, add remaining 2 T. flour. Whisk in milk and stir until thickened. Pour in tomatoes, tomato paste and 1/2 C. water. Reduce heat to medium-low and stir. Add Italian seasoning and basil. Season with salt and pepper, if desired, and cook for another 5 minutes. To serve, place 1 C. gnocchi in a bowl and toss with 1 C. of sauce. Garnish with additional basil, if desired. Here it is folks… Episode 1 of the 1 Eye Wine Guy video blog. Hope you like it! Click here to visit the 2008 Washington Riesling page on Kiona’s website. This wine can be found for around $10 across the United States. 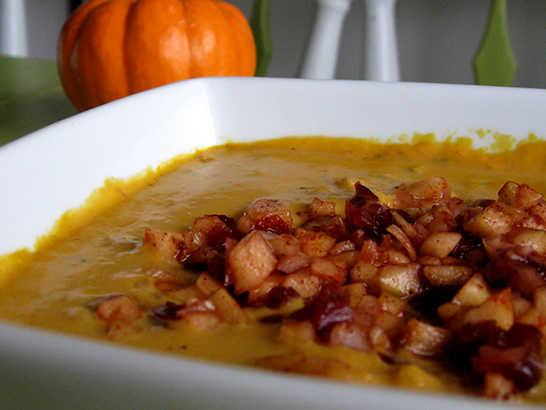 Some of you have asked for the spicy pumpkin soup recipe, so here it is! We will be sure to post all of the future recipes as well. Heat a soup pot over medium to medium high heat. Add the oil and melt the butter. Add bay leaf, chopped celery and onion, and season with salt and pepper. Cook for about 7 minutes under tender. Add flour, poultry seasoning (or ground thyme), and hot sauce, to taste, then cook for another minute. Whisk in chicken stock and scrape bottom, bring to a bubble. Whisk in pumpkin in large spoonfuls to incorporate it into the broth. Simmer soup for 10 minutes to thicken, then add the cream and nutmeg. Reduce heat to low until ready to serve. While soup cooks, assemble relish: combine apple, onion, cranberries, lemon juice, chili powder, honey and cinnamon. Adjust seasonings in soup and relish and serve in shallow bowls with a few spoonfuls of relish. Don’t skip the relish, it really brings the flavors of the soup and 2008 Kiona Riesling together. Enjoy!